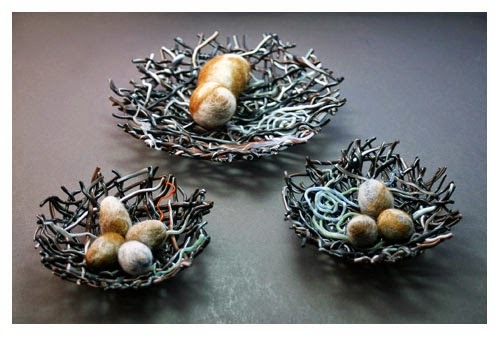 I am very excited to exhibit this series, titled Nested, for the first time as part of the San Antonio Glass Art Guild juried exhibition Untamed. 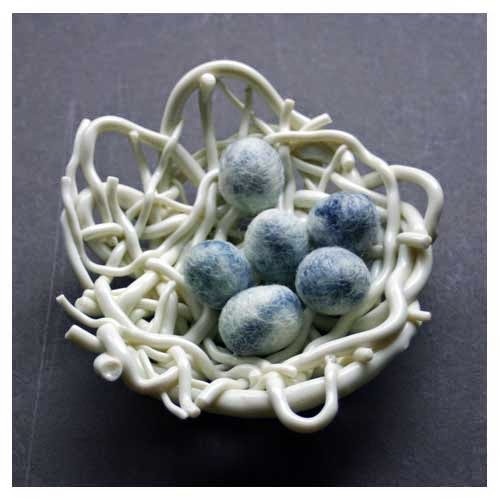 These pieces include flameworked and kilnformed glass to form the nest and felted wool for the eggs. The inspiration behind this series came several years ago. In June of 2009, while at a farmers market in Portland, Oregon I purchased a skein of hand spun wool. The fiber varied in thickness and color. It had character and I purchased it not knowing what it would become, only that I could and would make it into something wonderful. I carried this soft mass back to San Antonio as a prized possession. I would have to give it thought to determine the right use for this material. But before I could take action my nine month old puppy did. When I found her the once nicely wrapped ball of yarn was pulled apart, twisted and contorted, tied in knots and ripped in places. I immediately became angry, irate even. I grabbed the mass of fiber and sat down at the top of the stairs. Slowly I began to work out segments. It took well over an hour for me to unravel the mass of tangled threads, tying the broken ends and rewinding it back into a tight ball. As I did this my fingers worked apart the spider web like fabric. My anger slowed, my eyes and fingers focus and my mind flooded with memories. It wasn't till 2011 that I finally did something with that ball of wool. And not till this year that the experience has finally come full circle in these glass and wool pieces. I look forward to making more and seeing how they evolve as yet even more time passes.